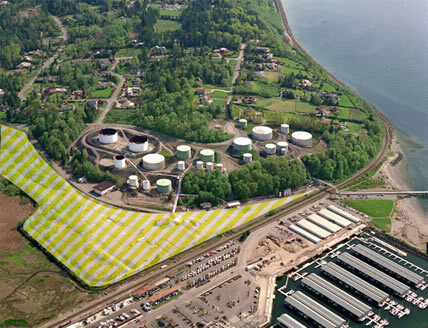 Petroleum releases occurred at the Unocal Edmonds bulk fuel facility during its operation from the 1920s to the 1990s. These releases contaminated soil and groundwater in the Upper and Lower Yards of the facility. Cleanup work in the Upper Yard was completed in 2003. The soil has been cleaned to Washington State Department of Ecology standards. At the 23-acre Lower Yard, Unocal performed several remedial actions to remove petroleum and contaminated soil in 2001 and 2003. In 2004, Unocal assessed the extent of contamination in the Lower Yard. Unocal verified that soil in the Lower Yard, and surface water and sediment in the Willow Creek drainage ditch adjacent to the site, were contaminated with petroleum and heavy metals. Cleanup work at the Lower Yard site began in 2007. This work is a continuation of the remediation work that has been ongoing at the site since 2001. Excavated soil with metals contamination exceeding Washington State Department of Ecology standards. This was to protect against direct contact with the soil (such as ingestion) and impacts to the groundwater. Excavated soil with petroleum contamination exceeding safe levels for direct contact. Excavation of this soil was for protection of groundwater and surface water. Excavated contaminated sediment in Willow Creek, on the northern edge of the site. The primary excavation work at the Lower Yard (including the Willow Creek area) was complete by September 2008. Over 140,000 tons of contaminated soil and 9,000 gallons of petroleum product have been removed from the site. The Lower Yard site was re-graded and reseeded. The Willow Creek area was replanted with native vegetation. In October 2008, Chevron EMC installed 28 wells to begin monitoring of groundwater at the site. Data is being collected to determine if the remaining petroleum concentrations in the soil following excavation are protective of the groundwater. Evaluation of the data is ongoing, and that evaluation will determine the options for final cleanup actions. During the fall of 2017, Chevron EMC conducted remedial actions in the two remaining areas of the Lower Yard that required additional cleanup: stormwater Detention Basin No. 2 and an area in the vicinity of a Washington State Department of Transportation storm drain crossing the site. Cleanup methods were soil excavation and installation of a dual phase extraction (DPE) remediation system. The system will remain in operation until groundwater and soil vapor conditions meet State cleanup standards. In this 2001 aerial photo, the former bulk fuel tanks of the Upper Yard are shown above the Lower Yard, (shaded).